The United States government created the Chickamauga and Chattanooga National Military Park in 1890. It preserves the vast majority of the land on which the battle of Chickamauga was fought. Today the park is wonderfully preserved and easy to tour. Still, there are changes from the 1863 wartime appearance. Most of the fields where fighting took place on September 20th are still there in more or less the same condition. However, many of the smaller farms, fields, and roads where the troops fought on the 19th have been reclaimed by the forest or changed in one way or the other. The following pictures and video show the park and the scenes of the fighting from multiple angles and locations. The map below is divided into sections. Click on a section to see the pictures, and the point of view from which they were taken. 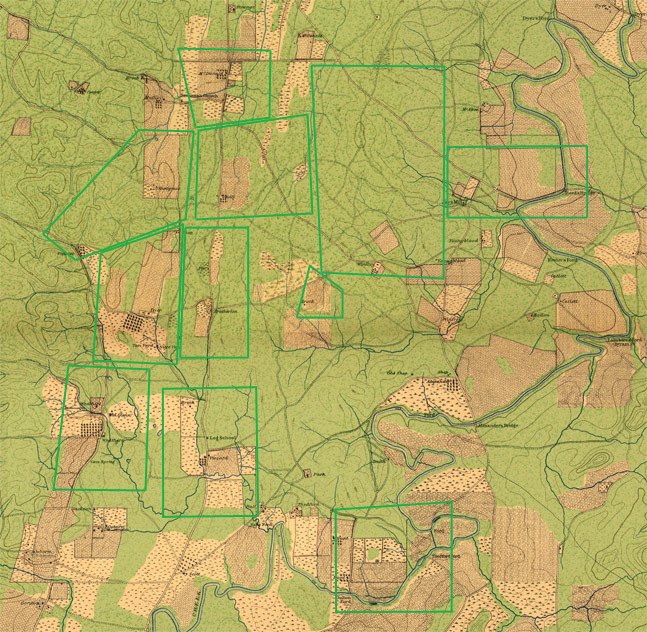 Despite the modern changes, the map used below shows the battlefield as it looked during 1863 so at to better match the other maps on the website showing the unit movements and fighting.